My comment a few posts ago that "photography is 90% mental" may have raised a few eyebrows. My guess is that most people would disagree with that statement. You're supposed to take the photo when it "feels" right, and appreciating fine photos in a gallery is all about responding emotionally to prints. Does the work hit you in the gut or not? I've never felt this way about photography. I approach it intellectually the same way I've always approached everything. I'm one of those left-brained nerds completely out of touch with my feelings, and I'm ok with that. I'll take Friedlander over Frank any day, Ken Josephson over Robert Adams, and Michael Bishop over Eggleston. 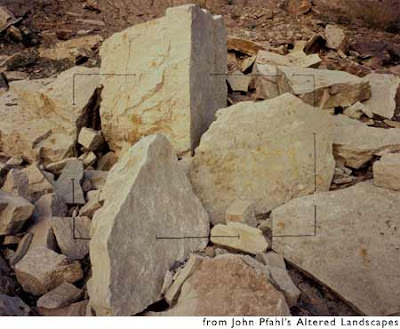 For me John Pfahl's Altered Landscapes leaves Power Places in the dust. You get the drift. I realize those percentages don't add up to 100 but how do they make you feel?